This article is about the Catholic military order. For other uses, see Order of Saint John (disambiguation) and Knights of Malta (disambiguation). The Sovereign Military Order of Malta (SMOM), officially the Sovereign Military Hospitaller Order of Saint John of Jerusalem, of Rhodes and of Malta (Italian: Sovrano Militare Ordine Ospedaliero di San Giovanni di Gerusalemme di Rodi e di Malta; Latin: Supremus Militaris Ordo Hospitalarius Sancti Ioannis Hierosolymitani Rhodiensis et Melitensis) and also known as the Order of Malta, is a Catholic lay religious order, traditionally of military, chivalric and noble nature. "Defence of the faith and assistance to the poor"
It is the continuation of the medieval Order of Saint John, also known as the Knights Hospitaller, under international law. As a chivalric order, it was founded c. 1099 by the Blessed Gerard in medieval Jerusalem. As a subject of international law, it is an establishment of the 19th century, recognized at the Congress of Verona of 1822, and since 1834 headquartered in Palazzo Malta in Rome. The order is led by an elected Prince and Grand Master. Its motto is Tuitio fidei et obsequium pauperum ('defence of the [Catholic] faith and assistance to the poor'). The order venerates the Virgin Mary as its patroness, under the title of Our Lady of Mount Philermos. The headquarters of the Order of Saint John had been located in Malta from 1530 until 1798. It was technically a vassal of the Kingdom of Sicily, holding Malta in exchange for a nominal fee, but declared independence in 1753. It was expelled from Malta under the French occupation in 1798 and, from 1805 to 1812, much of its possessions in Protestant Europe were confiscated, resulting in the fragmentation of the order into a number of Protestant branches, since 1961 united under the umbrella of the Alliance of the Orders of Saint John of Jerusalem. The Congress of Vienna of 1815 confirmed the loss of Malta, but the Congress of Verona in 1822 guaranteed the continued existence of the Catholic order as a sovereign entity. The seat of the order was moved to Ferrara in 1826 and to Rome in 1834, the interior of Palazzo Malta being considered extraterritorial sovereign territory of the order. The grand priories of Lombardy-Venetia and of Sicily were restored from 1839 to 1841. The office of Grand Master was restored by Pope Leo XIII in 1879, after a vacancy of 75 years, confirming Giovanni Battista Ceschi a Santa Croce as the first Grand Master of the restored Order of Malta. The Holy See was established as a subject of international law in the Lateran Treaty of 1929. In the following decades, the connection between the Holy See and the Order of Malta was seen as so close as to call into question the actual sovereignty of the order as a separate entity. This has prompted constitutional changes on the part of the Order, which were implemented in 1997. Since then, the Order has been widely recognized as a sovereign subject of international law in its own right. It maintains diplomatic relations with 107 states, has permanent observer status at the United Nations, enters into treaties and issues its own passports, coins and postage stamps. Its two headquarters buildings in Rome enjoy extraterritoriality, similar to embassies, and it maintains embassies in other countries. The three principal officers are counted as citizens. The order has a large number of local priories and associations around the world, but there also exist a number of organizations with similar-sounding names that are unrelated, including numerous fraudulent (self-styled) orders seeking to capitalize on the name. In the ecclesiastical heraldry of the Catholic Church, the Order of Malta is one of only two orders (along with the Order of the Holy Sepulchre) whose insignia may be displayed in a clerical coat of arms. (Laypersons have no such restriction.) The shield is surrounded with a silver rosary for professed knights, or for others the ribbon of their rank. Members may also display the Maltese cross behind their shield instead of the ribbon. In order to protect its heritage against frauds, the order has legally registered 16 versions of its names and emblems in some 100 countries. 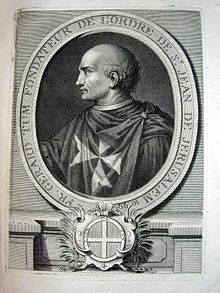 Gerard Thom, founder of the Order of Saint John of Jerusalem. Copper engraving by Laurent Cars, c. 1725. The birth of the order dates back to around 1048. Merchants from the ancient Marine Republic of Amalfi obtained from the Caliph of Egypt the authorisation to build a church, convent, and hospital in Jerusalem, to care for pilgrims of any religious faith or race. The Order of St. John of Jerusalem–the monastic community that ran the hospital for the pilgrims in the Holy Land–became independent under the guidance of its founder, the religious brother Gerard. With the Papal bull Pie postulatio voluntatis dated 15 February 1113, Pope Paschal II approved the foundation of the Hospital and placed it under the aegis of the Holy See, granting it the right to freely elect its superiors without interference from other secular or religious authorities. By virtue of the Papal Bull, the hospital became an order exempt from the control of the local church. All the Knights were religious, bound by the three monastic vows of poverty, chastity and obedience. The constitution of the Christian Kingdom of Jerusalem during the Crusades obliged the order to take on the military defence of the sick, the pilgrims, and the captured territories. The order thus added the task of defending the faith to that of its hospitaller mission. As time went on, the order adopted the white eight-pointed Cross that is still its symbol today. The eight points represent the eight "beatitudes" that Jesus pronounced in his Sermon on the Mount. When the last Christian stronghold in the Holy Land fell after the Siege of Acre in 1291, the order settled first in Cyprus. In 1310, led by Grand Master Fra' Foulques de Villaret, the knights regrouped on the island of Rhodes. From there, the defense of the Christian world required the organization of a naval force; so the Order built a powerful fleet and sailed the eastern Mediterranean, fighting battles for the sake of Christendom, including Crusades in Syria and Egypt. In the early 14th century, the institutions of the Order and the knights who came to Rhodes from every corner of Europe were grouped according to the languages they spoke. The first seven such groups, or Langues (Tongues) – from Provence, Auvergne, France, Italy, Aragon (Navarre), England (with Scotland and Ireland), and Germany – became eight in 1492, when Castille and Portugal were separated from the Langue of Aragon. Each Langue included Priories or Grand Priories, Bailiwicks, and Commanderies. The Order was governed by its Grand Master, the Prince of Rhodes, and its Council. From its beginning, independence from other nations granted by pontifical charter and the universally recognised right to maintain and deploy armed forces constituted grounds for the international sovereignty of the Order, which minted its own coins and maintained diplomatic relations with other States. The senior positions of the Order were given to representatives of different Langues. In 1523, after six months of siege and fierce combat against the fleet and army of Sultan Suleiman the Magnificent, the Knights were forced to surrender, and left Rhodes with military honours. The order remained without a territory of its own until 1530, when Grand Master Fra' Philippe de Villiers de l'Isle Adam took possession of the island of Malta, granted to the order by Emperor Charles V, Holy Roman Emperor and his mother Queen Joanna of Castile as monarchs of Sicily, with the approval of Pope Clement VII, for which the order had to honour the conditions of the Tribute of the Maltese Falcon. The Reformation which split Western Europe into Protestant and Catholic states affected the knights as well. In several countries, including England, Scotland and Sweden, the order was dissolved. In others, including the Netherlands and Germany, entire bailiwicks or commanderies (administrative divisions of the order) experienced religious conversions; these "Johanniter orders" survive in Germany, the Netherlands, and Sweden and many other countries, including the United States and South Africa. It was established that the order should remain neutral in any war between Christian nations. From 1651 to 1665, the Order of Saint John ruled four islands in the Caribbean. On 21 May 1651, it acquired the islands of Saint Barthélemy, Saint Christopher, Saint Croix and Saint Martin. These were purchased from the French Compagnie des Îles de l'Amérique which had just been dissolved. In 1665, the four islands were sold to the French West India Company. In 1565, the Knights, led by Grand Master Fra' Jean de Vallette (after whom the capital of Malta, Valletta, was named), defended the island for more than three months during the Great Siege by the Turks. The fleet of the order contributed to the ultimate destruction of the Ottoman naval power in the Battle of Lepanto in 1571, led by John of Austria, half brother of King Philip II of Spain. Their Mediterranean stronghold of Malta was captured by the French First Republic under Napoleon in 1798 during his expedition to Egypt, following the French Revolution and the subsequent French Revolutionary Wars. Napoleon demanded from Grand Master Ferdinand von Hompesch zu Bolheim that his ships be allowed to enter the port and to take on water and supplies. The Grand Master replied that only two foreign ships could be allowed to enter the port at a time. Bonaparte, aware that such a procedure would take a very long time and would leave his forces vulnerable to Admiral Nelson, immediately ordered a cannon fusillade against Malta. The French soldiers disembarked in Malta at seven points on the morning of 11 June and attacked. After several hours of fierce fighting, the Maltese in the west were forced to surrender. Napoleon opened negotiations with the fortress capital of Valletta. Faced with vastly superior French forces and the loss of western Malta, the Grand Master negotiated a surrender to the invasion. Hompesch left Malta for Trieste on 18 June. He resigned as Grand Master on 6 July 1799. The knights were dispersed, though the order continued to exist in a diminished form and negotiated with European governments for a return to power. The Russian Emperor, Paul I, gave the largest number of knights shelter in Saint Petersburg, an action which gave rise to the Russian tradition of the Knights Hospitaller and the Order's recognition among the Russian Imperial Orders. The refugee knights in Saint Petersburg proceeded to elect Tsar Paul as their Grand Master – a rival to Grand Master von Hompesch until the latter's abdication left Paul as the sole Grand Master. Grand Master Paul I created, in addition to the Roman Catholic Grand Priory, a "Russian Grand Priory" of no fewer than 118 Commanderies, dwarfing the rest of the Order and open to all Christians. Paul's election as Grand Master was, however, never ratified under Roman Catholic canon law, and he was the de facto rather than de jure Grand Master of the Order. By the early 19th century, the order had been severely weakened by the loss of its priories throughout Europe. Only 10% of the order's income came from traditional sources in Europe, with the remaining 90% being generated by the Russian Grand Priory until 1810. This was partly reflected in the government of the Order being under Lieutenants, rather than Grand Masters, in the period 1805 to 1879, when Pope Leo XIII restored a Grand Master to the order. This signaled the renewal of the order's fortunes as a humanitarian and religious organization. On 19 September 1806, the Swedish government offered the sovereignty of the island of Gotland to the Order. The offer was rejected since it would have meant the Order renouncing their claim to Malta. The French forces occupying Malta expelled the knights from their country. The Treaty of Amiens (1802) obliged the United Kingdom to evacuate Malta which was to be restored to a recreated Order of St. John, whose sovereignty was to be guaranteed by all of the major European powers, to be determined at the final peace. However, this was not to be because objections to the treaty quickly grew in the UK. Bonaparte's rejection of a British offer involving a ten-year lease of Malta prompted the reactivation of the British blockade of the French coast; Britain declared war on France on 18 May. The 1802 treaty was never implemented. The UK gave its official reasons for resuming hostilities as France's imperialist policies in the West Indies, Italy, and Switzerland. After having temporarily resided in Messina, Catania, and Ferrara, in 1834 the precursor of the Sovereign Military Order of Malta settled definitively in Rome, where it owns, with extraterritorial status, the Magistral Palace in Via Condotti 68 and the Magistral Villa on the Aventine Hill. The original hospitaller mission became the main activity of the order, growing ever stronger during the last century, most especially because of the contribution of the activities carried out by the Grand Priories and National Associations in so many countries around the world. Large-scale hospitaller and charitable activities were carried out during World Wars I and II under Grand Master Fra' Ludovico Chigi Albani della Rovere (1931–1951). Under the Grand Masters Fra' Angelo de Mojana di Cologna (1962–88) and Fra' Andrew Bertie (1988–2008), the projects expanded. Two bilateral treaties have been concluded with the Republic of Malta. The first treaty is dated 21 June 1991 and is now no longer in force. The second treaty was signed on 5 December 1998 and ratified on 1 November 2001. This agreement grants the Order the use with limited extraterritoriality of the upper portion of Fort St. Angelo in the city of Birgu. Its stated purpose is "to give the Order the opportunity to be better enabled to carry out its humanitarian activities as Knights Hospitallers from Saint Angelo, as well as to better define the legal status of Saint Angelo subject to the sovereignty of Malta over it". The agreement has a duration of 99 years, but the document allows the Maltese Government to terminate it at any time after 50 years. Under the terms of the agreement, the flag of Malta is to be flown together with the flag of the Order in a prominent position over Saint Angelo. No asylum may be granted by the Order and generally the Maltese courts have full jurisdiction and Maltese law shall apply. The second bilateral treaty mentions a number of immunities and privileges, none of which appeared in the earlier treaty. In February 2013, the order celebrated the 900th anniversary of its papal recognition with a general audience with Pope Benedict XVI and a Mass celebrated by Cardinal Tarcisio Bertone in Saint Peter's Basilica. The Order experienced a leadership crisis beginning in December 2016, when Albrecht von Boeselager protested his removal as Grand Chancellor by Grand Master Matthew Festing. After considerable publicity and competing accounts given by several parties, in January 2017 Pope Francis ordered von Boeselager reinstated and required Festing's resignation. Francis also named Archbishop Giovanni Becciu, as his personal representative to the Order–sidelining the Order's Cardinal Patron Raymond Burke–until the election of a new Grand Master. In May 2017, the Order named Mauro Bertero Gutiérrez, a Bolivian member of the Government Council, to lead its constitutional reform process. And in May 2018 when a new Grand Master was elected, Francis extended Becciu's mandate indefinitely. In June 2017, in a departure from tradition, the leadership of the Order wore informal attire rather than formal wear full dress uniforms to their annual papal audience. The proceedings of the Order are governed by its Constitutional Charter and the Order's Code. It is divided internationally into six territorial Grand Priories, six Sub-Priories and 47 national associations. The supreme head of the Order is the Prince and Grand Master, who is elected for life by the Council Complete of State, holds the precedence of a cardinal of the Church since 1630 and received the rank of Prince of the Holy Roman Empire in 1607. Fra' Giacomo dalla Torre del Tempio di Sanguinetto was elected 80th Grand Master on 2 May 2018, a year after Fra' Matthew Festing resigned as Grand Master at the insistence of Pope Francis. Electors in the Council Complete of State include the members of the Sovereign Council, other office-holders and representatives of the members of the Order. The Grand Master is aided by the Sovereign Council (the government of the Order), which is elected by the Chapter General, the legislative body of the Order. The Chapter General meets every five years; at each meeting, all seats of the Sovereign Council are up for election. The Sovereign Council includes six members and four High Officers: the Grand Commander, the Grand Chancellor, the Grand Hospitaller and the Receiver of the Common Treasure. The Grand Commander is the chief religious officer of the Order and serves as Lieutenant "ad interim" during a vacancy in the office of Grand Master. The Grand Chancellor, whose office includes those of the Ministry of the Interior and Ministry of Foreign Affairs, is the head of the executive branch; he is responsible for the Diplomatic Missions of the Order and relations with the national Associations. The Grand Hospitaller's responsibilities include the offices of Minister for Humanitarian Action and Minister for International Cooperation; he coordinates the Order's humanitarian and charitable activities. Finally, the Receiver of the Common Treasure is the Minister of Finance and Budget; he directs the administration of the finances and property of the Order. The patron, who is either a cardinal when appointed by the pope or soon raised to that rank, promotes the spiritual interests of the Order and its members, and its relations with the Holy See. The pope appoints the prelate of the order to supervise the clergy of the order, choosing from among three candidates proposed by the Grand Master. On 4 July 2015 Pope Francis named as prelate Bishop Jean Laffitte, who had held various offices in the Roman Curia for more than a decade. Laffitte succeeded Archbishop Angelo Acerbi, who had held the office since 2001. Laffitte's appointment followed the traditional meeting between the pope and the Grand Master, and an audience with the Grand Chancellor and others as well, held on 24 June, the feast of St. John the Baptist. First Class, containing only one category: Knights of Justice or Professed Knights, and the Professed Conventual Chaplains, who take religious vows of poverty, chastity, and obedience and form what amounts to a religious order. Until the 1990s membership in this class was restricted to members of families with noble lineages. There are also three surviving enclosed monasteries of nuns of the Order, two in Spain that date from the 11/12th centuries and one in Malta, whose members hold the same rank in the Order as chaplains. Second Class: Knight and Dames in Obedience, similarly restricted until recently, these knights and dames make a promise, rather than a vow, of obedience. This class is subdivided into three categories, namely that of Knight and Dames of Honour and Devotion in Obedience, Knight and Dames of Grace and Devotion in Obedience, and Knight and Dames of Magistral Grace in Obedience. Third Class, which is subdivided into six categories: Knights and Dames of Honour and Devotion, Conventual Chaplains ad honorem, Knights and Dames of Grace and Devotion, Magistral Chaplains, Knights and Dames of Magistral Grace, and Donats (male and female) of Devotion. All categories of this class are made up of members who take no vows and who had to show a decreasingly extensive history of nobility. Knights of magistral grace need not prove any noble lineage and are the most common class of knights in the United States. Within each class and category of knights are ranks ranging from bailiff grand cross (the highest) through knight grand cross, and knight — thus one could be a "knight of grace and devotion," or a "bailiff grand cross of justice." The final rank of donat is offered to some who join the order in the class of "justice" but who are not knights. Bishops and priests are generally honorary members, or knights, of the Order of Malta. However, there are some priests who are full members of the Order, and this is usually because they were conferred knighthood prior to ordination. The priests of the Order of Malta are ranked as Honorary Canons, as in the Order of the Holy Sepulchre; and they are entitled to wear the black mozetta with purple piping and purple fascia. Prior to the 1990s, all officers of the Order had to be of noble birth (i.e., armigerous for at least a hundred years), as they were all knights of justice or of obedience. However, Knights of Magistral Grace (i.e., those without noble proofs) now may make the Promise of Obedience and, at the discretion of the Grand Master and Sovereign Council, may enter the novitiate to become professed Knights of Justice. Worldwide, there are over 13,000 knights and dames, of whom approximately 55 are professed religious. Membership in the Order is by invitation only and solicitations are not entertained. The Order's finances are audited by a Board of Auditors, which includes a President and four Councillors, all elected by the Chapter General. The Order's judicial powers are exercised by a group of Magistral Courts, whose judges are appointed by the Grand Master and Sovereign Council. 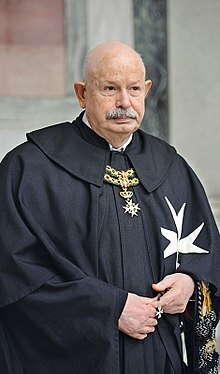 The Sovereign Military Order of Malta has collaborated with other mutually-recognized Orders of Saint John; for example, the SMOM is a major donor of the St John Eye Hospital in Jerusalem, which is primarily operated by the Venerable Order of Saint John. Its annual budget is on the order of 1.5 billion Euros, largely funded by European governments, the U.N., and the European Union, fundations and public donors. 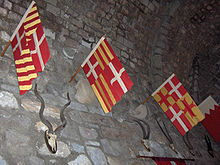 Flags of Knights Hospitaller in Saint Peter's Castle, Bodrum, Turkey. SMOM has formal diplomatic relations with 108 states and has official relations with another five states and with the European Union. Additionally it has relations with the International Committee of the Red Cross and a number of international organizations, including observer status at the UN and some of the specialized agencies. Its international nature is useful in enabling it to pursue its humanitarian activities without being seen as an operative of any particular nation. Its sovereignty is also expressed in the issuance of passports, licence plates, stamps, and coins. With its unique history and unusual present circumstances, the exact status of the Order in international law has been the subject of debate. It describes itself as a "sovereign subject of international law." Its two headquarters in Rome – the Palazzo Malta in Via dei Condotti 68, where the Grand Master resides and Government Bodies meet, and the Villa del Priorato di Malta on the Aventine, which hosts the Grand Priory of Rome – Fort St. Angelo on the island of Malta, the Embassy of the Order to Holy See and the Embassy of the Order to Italy have all been granted extraterritoriality by Italy and Malta. Unlike the Holy See, however, which is sovereign over Vatican City and thus has clear territorial separation of its sovereign area and that of Italy, SMOM has had no territory since the loss of the island of Malta in 1798, other than only those current properties with extraterritoriality listed above. Italy recognizes, in addition to extraterritoriality, the exercise by SMOM of all the prerogatives of sovereignty in its headquarters. Therefore, Italian sovereignty and SMOM sovereignty uniquely coexist without overlapping. The United Nations does not classify it as a "non-member state" or "intergovernmental organization" but as one of the "other entities having received a standing invitation to participate as observers." For instance, while the International Telecommunication Union has granted radio identification prefixes to such quasi-sovereign jurisdictions as the United Nations and the Palestinian Authority, SMOM has never received one. For awards purposes, amateur radio operators consider SMOM to be a separate "entity", but stations transmitting from there use an entirely unofficial callsign, starting with the prefix "1A". Likewise, for internet and telecommunications identification, the SMOM has neither sought nor been granted a top-level domain or international dialling code, whereas the Vatican City uses its own domain (.va), and has been allocated the country code +379. There are differing opinions as to whether a claim to sovereign status has been recognized. Ian Brownlie, Helmut Steinberger, and Wilhelm Wengler are among experts who say that the claim has not been recognized. Even taking into account the Order's ambassadorial diplomatic status among many nations, a claim to sovereign status is sometimes rejected. The Order maintains diplomatic missions around the world and many of the states reciprocate by accrediting ambassadors to the Order (usually their ambassador to the Holy See). Wengler—a German professor of international law—addresses this point in his book Völkerrecht (1964), and rejects the notion that recognition of the Order by some states can make it a subject of international law. Conversely, professor Rebecca Wallace—writing more recently in her book International Law (1986)—explains that a sovereign entity does not have to be a country, and that SMOM is an example of this. This position appears to be supported by the number of nations extending diplomatic relations to the Order, which more than doubled from 49 to 100 in the 20-year period to 2008. In 1953, the Holy See decreed that the Order of Malta's quality as a sovereign institution is functional, to ensure the achievement of its purposes in the world, and that as a subject of international law, it enjoys certain powers, but not the entire set of powers of sovereignty "in the full sense of the word." On 24 June 1961, Pope John XXIII approved the Constitutional Charter, which contains the most solemn reaffirmations of the sovereignty of the Order. Article 1 affirms that "the Order is a legal entity formally approved by the Holy See. It has the quality of a subject of international law." Article 3 states that "the intimate connection existing between the two qualities of a religious order and a sovereign order do not oppose the autonomy of the order in the exercise of its sovereignty and prerogatives inherent to it as a subject of international law in relation to States." The SMOM coins are appreciated more for their subject matter than for their use as currency; SMOM postage stamps, however, have been gaining acceptance among Universal Postal Union member nations. The SMOM began issuing euro-denominated postage stamps in 2005, although the scudo remains the official currency of the SMOM. Also in 2005, the Italian post agreed with the SMOM to deliver internationally most classes of mail other than registered, insured, and special-delivery mail; additionally 56 countries recognize SMOM stamps for franking purposes, including those such as Canada and Mongolia that lack diplomatic relations with the Order. The Order states that it was the hospitaller role that enabled the Order to survive the end of the crusading era; nonetheless, it retains its military title and traditions. On 26 March 1876, the Association of the Italian Knights of the Sovereign Military Order of Malta (Associazione dei cavalieri italiani del sovrano militare ordine di Malta, ACISMOM) reformed the Order's military to a modern military unit of the era. 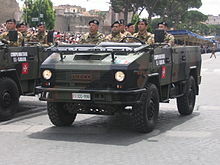 This unit provided medical support to the Italian Army and on 9 April 1909 the military corps officially became a special auxiliary volunteer corps of the Italian Army under the name Corpo Militare dell'Esercito dell'ACISMOM (Army Military Corps of the ACISMOM), wearing Italian uniforms. Since then the Military Corps have operated with the Italian Army both in wartime and peacetime in medical or paramedical military functions, and in ceremonial functions for the Order, such as standing guard around the coffins of high officers of the Order before and during funeral rites. I believe that it is a unique case in the world that a unit of the army of one country is supervised by a body of another sovereign country. Just think that whenever our staff (medical officers mainly) is engaged in a military mission abroad, there is the flag of the Order flying below the Italian flag. —  Fausto Solaro del Borgo, President of the Italian Association of the Sovereign Military Order of Malta, stated in a speech given in London in November 2007. 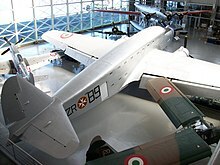 In 1947, after the post-World War II peace treaty forbade Italy to own or operate bomber aircraft and only operate a limited number of transport aircraft, the Italian Air Force opted to transfer some of its Savoia-Marchetti SM.82 aircraft to the Sovereign Military Order of Malta, pending the definition of their exact status (the SM.82 were properly long range transport aircraft that could be adapted for bombing missions). These aircraft were operated by Italian Air Force personnel temporarily flying for the Order, carried the Order's roundels on the fuselage and Italian ones on the wings, and were used mainly for standard Italian Air Force training and transport missions but also for some humanitarian tasks proper of the Order of Malta (like the transport of sick pilgrims to the Lourdes sanctuary). In the early '50s, when the strictures of the peace treaty had been much relaxed by the Allied authorities, the aircraft returned under full control of the Italian Air Force. One of the aircraft transferred to the Order of Malta, still with the Order's fuselage roundels, is preserved in the Italian Air Force Museum. The Military Corps has become known in mainland Europe for its operation of hospital trains, a service which was carried out intensively during both World Wars. The Military Corps still operate a modern 28-car hospital train with 192 hospital beds, serviced by a medical staff of 38 medics and paramedics provided by the Order and a technical staff provided by the Italian Army Railway Engineers Regiment. ^ Article 7 of the Constitutional Charter and Code. ^ Sack, John (1959). Report from Practically Nowhere. Harper. p. 140. as part of the bargain only three men – the grand master, the lieutenant grand master, and the chancellor – could be citizens there. The other S.M.O.M.ians were to be citizens of the country they lived in." ^ a b c The order's website says "its programmes include medical and social assistance, disaster relief in the case of armed conflicts and natural catastrophes, emergency services and first aid corps, help for the elderly, the handicapped and children in need and the provision of first aid training, and support for refugees and internally displaced persons regardless of race, origin or religion." ^ "Italy: Knights of Malta rejects alleged link to military action – Adnkronos Religion". Adnkronos.com. 7 April 2003. Retrieved 17 March 2010. ^ "Sovereign Order of Malta". Orderofmalta.int. Retrieved 12 April 2016. ^ Sainty, Guy Stair, ed. World Orders of Knighthood and Merit, Burke's, August 2006. ^ Keating, Joshua E. (19 January 2011). "Who Are the Knights of Malta — and What Do They Want?". Foreign Policy. Retrieved 29 August 2018. ^ "Malta Permanent Mission to the United Nations". Un.int. Retrieved 12 April 2016. ^ "Pseudo Orden und ihr Auftreten in Österreich 1996–2008". Malteserorden.at. Archived from the original on 14 March 2013. Retrieved 13 November 2014. ^ "Names of the Order". Sovereign Order of Malta. Retrieved 25 January 2017. ^ Cole, Juan (2007). Napoleon's Egypt: Invading the Middle East. Palgrave Macmillan. pp. 8–9. ^ Cole, Juan (2007). Napoleon's Egypt: Invading the Middle East. Palgrave Macmillan. p. 9. ^ Cole, Juan (2007). Napoleon's Egypt: Invading the Middle East. Palgrave Macmillan. p. 10. ^ Whitworth Porter, A History of the Knights of Malta (London: Longman, Brown, Green, 1858). p. 457. ^ "Focus on Malta – History". Focusmm.com. Retrieved 2008-10-12. ^ Stair Sainty, Guy (2000). "From the loss of Malta to the modern era". ChivalricOrders.org. Archived from the original on 6 March 2012. ^ Pièces diverses relatives aux operations militaires et pol. du gén. Bonaparte (in French). Paris: De l'imprimerie de P. Didot l'aîné. 1800. p. 32. ^ "Agreement Between The Government of Malta and The Government of the Sovereign Military Hospitaller Order of St. John of Jerusalem, of Rhodes and of Malta". p. 1093. Retrieved 20 June 2018. ^ "After Two Centuries, the Order of Malta Flag Flies over Fort St. Angelo beside the Maltese Flag". Order of Malta. 13 March 2001. Retrieved 13 November 2014. ^ "Knights of Malta Catholic order celebrates 900 years". BBC News. 9 February 2013. Archived from the original on 10 February 2013. Retrieved 10 February 2013. ^ Tornielli, Andrea (26 January 2017). "The Order of Malta's crisis". La Stampa. Retrieved 26 January 2017. ^ "Vatican condom row: pope prevails as Knights of Malta chief resigns". The Guardian. Reuters in Vatican City. 24 January 2017. Retrieved 24 January 2017. ^ Pullella, Philip (29 January 2017). "The Knights of Malta-Vatican feud: a tale of chivalry and sovereignty". Reuters. Retrieved 28 January 2017. ^ "Pope intervenes in Knights of Malta after head resigns under pressure". Reuters. 24 January 2017. Retrieved 24 January 2017. ^ Pentin, Edward (26 January 2017). "Pope Francis Declares All of Festing's Recent Acts 'Null and Void'". National Catholic Register. Retrieved 26 January 2017. ^ Allen J., John L. (13 May 2011). "A triptych on Benedict's papacy, and hints of what lies beyond". National Catholic Reporter. Retrieved 8 February 2017. Becciu was Substitute for General Affairs of the Secretariat of State, a position akin to that of a papal chief of staff. ^ "Lettera Pontificia al Sostituto per gli Affari Generali della Segreteria di Stato per la nomina a Delegato Speciale presso il Sovrano Militare Ordine di Malta" (in Italian). Holy See Press Office. 2 February 2017. Retrieved 16 May 2018. ^ Lamb, Christopher (30 January 2017). "Cardinal Burke 'in Office but out of Power' as Job Handed to Papal Delegate". The Tablet. Retrieved 30 January 2017. ^ O'Connell, Gerard (3 February 2017). "Dust up with Order of Malta ends not with a bang but a reinstatement". America Magazine. New York. Retrieved 17 April 2017. [Francis] made clear that the delegate would not have any role in the order's governance, out of respect for the order's sovereignty. ^ Arocho Esteves, Junno (3 August 2017). "Ancient order, modern times: Order of Malta focuses on renewal". National Catholic Reporter. Catholic News Service. Retrieved 21 August 2017. ^ "The Constitutional Reform of the Sovereign Order of Malta". Order of Malta. 28 June 2017. Retrieved 21 August 2017. ^ "Working to update the Constitution of the Sovereign Order of Malta". Order of Malta. 17 November 2017. Retrieved 7 June 2018. ^ "Letter of the Holy Father to the Special Delegate at the Sovereign Military Hospitaller Order of Saint John of Jerusalem, of Rhodes and of Malta (S.M.O.M. ), 04.05.2018" (Press release). Holy See Press Office. 4 May 2018. Retrieved 4 May 2018. ... up to the conclusion of the reform process and in any case until I consider it useful for the Order itself. ^ Brockhaus, Hannah (4 May 2018). "Pope Francis extends mandate of special delegate to Knights of Malta". Catholic News Agency. Retrieved 4 May 2018. ^ McElwee, Joshua J. (23 June 2017). "New Knights of Malta leader genuflects before Francis in Vatican meeting". National Catholic Reporter. Retrieved 21 August 2017. ^ "National Institutions". www.orderofmalta.int. Order of Malta. Retrieved 2 September 2016. ^ Sire, H.J.A. (1994). The Knights of Malta. Yale University Press p.221. ^ Lamb, Christopher (2 May 2018). "Knights of Malta elect Fra' Giacomo Dalla Torre as Grand Master". The Tablet. Retrieved 3 May 2018. ^ "Grand Hospitaller". Orderofmalta.int. Retrieved 13 November 2017. ^ "Receiver of the Common Treasure". Orderofmalta.int. Retrieved 13 November 2017. ^ "The Order of Malta's patron Paolo Sardi has been created cardinal". Sovereign Military Order of Malta. 25 November 2010. Retrieved 6 February 2017. ^ Rocco, Francis X. (10 November 2014). "Pope removes Cardinal Burke from Vatican post". National Catholic Reporter. Catholic News Service. Retrieved 6 February 2017. ^ "Mgr Jean Laffitte, prélat de l'Ordre souverain militaire de Malte". Zenit (in French). 4 July 2015. Retrieved 4 September 2016. ^ "Knights of Malta". Retrieved 2 January 2017. ^ "The Nuns of the Order of Malta". Retrieved 22 November 2017. ^ Sire, H.J.A. (2016). The Knights of Malta: A Modern Resurrection. London: Third Millennium. p. 278. ^ "Jerusalem Scene: The Newsletter of St John of Jerusalem Eye Hospital Group - Spring 2017 - Funding Today" (PDF). Saint John Eye Hospital Group. 2017. Retrieved 1 September 2018. ^ "Sovereign Order of Malta". Orderofmalta.int. Retrieved 23 April 2018. ^ "Sovereign Order of Malta – Official site". Orderofmalta.int. Retrieved 21 August 2011. ^ "SMOM Plates". Targheitaliane.it. 24 August 1994. Retrieved 17 March 2010. ^ "Sovereign Order of Malta – Official site". Orderofmalta.int. Retrieved 17 January 2018. ^ "The Coins of the Sovereign Order of Malta". Orderofmalta.int. Retrieved 17 January 2018. ^ Paul, Chevalier (pseudonym of a French knight of the SMOM). "An Essay on the Order of St. John (S.M.O.M.)". Archived from the original on 2 July 2003. Retrieved 8 October 2012. Minuscule as it is, the Order does also possess sovereign territory. 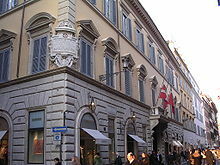 This consists of the land in Rome on which stands the Grand Magistracy in the Via Condotti and the Villa Malta. ^ a b Arocha, Magaly (May 1999). "La Orden de Malta y su Naturaleza Jurídica (The Order of Malta and Its Legal Nature)". Caracas, Distrito Capital, Venezuela: Analítica.com. Archived from the original on 1 August 2015. Retrieved 1 October 2012. ^ "UN Permanent Observers". Un.org. Retrieved 13 November 2014. ^ "ARRLWeb: DXCC Entities List (Current, 1A0-9Z)". Arrl.org. 6 May 2008. Archived from the original on 11 October 2007. Retrieved 17 March 2010. ^ "Internet Assigned Numbers Authority database of top level domains". Iana.org. Retrieved 17 March 2010. ^ "LIST OF ITU-T RECOMMENDATION E.164 ASSIGNED COUNTRY CODES" (PDF). ITU-T. 1 November 2011. Retrieved 19 May 2015. ^ "The French Republic does not recognise the SMOM as a subject of international law; see a statement by the spokesman of the French Ministry of Foreign Affairs, Feb 7, 1997". Heralda.org. Retrieved 13 November 2014. ^ Wallace, Rebecca (1986). International law: a student introduction (2nd ed.). Sweet & Maxwell Ltd. ISBN 0-421-33500-9. ^ "Mass commemorates knights leader". BBC News. 8 March 2008. Retrieved 2 May 2009. ^ "TRIBUNAL E CARDINALIZI O COSTITUITO CON PONTIFICIO CHIROGRAFO DEL 10 DICEMBRE 1951 (judgment dated 24 January 1953)" (PDF). Acta Apostolicae Sedis (in Italian). The Holy See. XLV (15): 765–767. 30 November 1953. Retrieved 13 February 2015. ^ "Associate Countries". Retrieved 22 January 2018. ^ a b Solaro del Borgo, Fausto (17 November 2007). "Address to British Association SMOM by Fausto Solaro del Borgo, President of the Italian Association London, 17 November" (PDF). Sovereign Military Order of Malta. Archived from the original (PDF) on 27 June 2008. Retrieved 10 February 2013. ^ "This photograph shows four members of the Corps standing guard at the coffin of a deceased Grand Master of the Order". Orderofmalta.int. Retrieved 12 April 2016. ^ Ordine di Malta. "TRENO OSPEDALE ATTREZZATO PER L'EMERGENZA". Orderofmalta.int. Archived from the original on 6 May 2012. Retrieved 13 November 2014. Patrick Levaye, Géopolitique du Catholicisme (Éditions Ellipses, 2007) ISBN 2-7298-3523-7. Riley-Smith, Jonathan, The Atlas of the Crusades. Facts on File, Oxford (1991). Cohen, R. (15 April 2004) . Julie Barkley, Bill Hershey and PG Distributed Proofreaders, ed. Knights of Malta, 1523–1798. Project Gutenberg. Retrieved 29 May 2006. Noonan, Jr., James-Charles (1996). The Church Visible: The Ceremonial Life and Protocol of the Roman Catholic Church. Viking. p. 196. ISBN 0-670-86745-4.
von Güttner-Sporzyński, Darius (15 January 2013) . Evolution and Adaptation: The Order of Saint John in War and Peace. Ordines Militares. Colloquia Torunensia Historica. Retrieved 9 September 2014. Read, Piers Paul (1999). The Templars. Imago. p. 118. ISBN 85-312-0735-5. Santolaria de Puey y Cruells, José-Apeles (1997). Escuela Diplomática Española, ed. Relaciones jurídicas internacionales de la Soberana Orden de San Juan de Malta. Google Docs. Tyerman, Christopher (2006). God's War: A New History of the Crusades. Allen Lane. p. 253. ISBN 0-7139-9220-4. Wallace, R.M.M (1992). International Law. Sweet and Maxwell. p. 76. Burlamacchi, Maurizio (2013). Nobility, Honour and Glory. 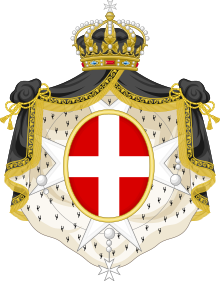 A brief military History of the Order of Malta. Olschki. ISBN 978 88 222 6247 9. Marcantonio COLONNA, The dictator pope. The inside story of the Francis Papacy, Washington DC, Regnery Publishing, 2017–2018. List of Italian knights of the Order of Malta from 1714 to 1907: Elenco dei cavaleri del S.M.Ordine di San Giovanni di Gerusalemme by Francesco Bonazzi (Napoli 1907).